Decide on a day for your fundraiser — you can maximize the number of shoppers you get by choosing a Saturday or a Sunday. 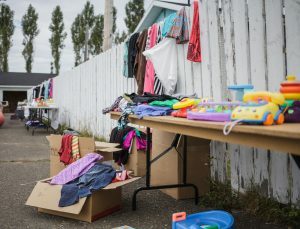 Rent out tables to parents looking to sell clothes, toys and other accessories that aren't needed any more (maybe for $10-20 each). You can also charge an entry fee of around a dollar to shoppers who are just browsing. For large items (such as high chairs and strollers) set aside a monitored room and make sure each item is marked so you're able to distribute the money accordingly afterwards. It's also a good idea to have a concession stand offering food and drink for shoppers and moms. Get everything right and it'll be an event that everyone looks forward to each year.